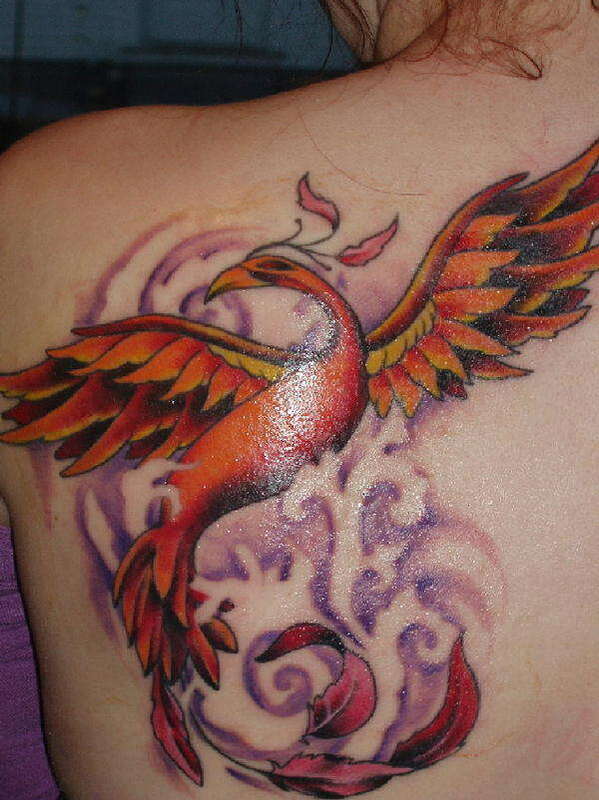 A phoenix is the legendary mythological bird of fire, which is very popular as a rebirth and resurrection symbol. The original meaning of phoenix in Greek is ‘palm tree’. There are many stories attached to this bird in Greek and Roman empires, ancient Middle East, India and China. It is said to be an extraordinary long living bird, which is also known for its beauty and luxuriant plumage. The bird is said to live for more than 500 years. A Jewish legend has it that the bird has a long life as it refused to eat the forbidden fruit of paradise. 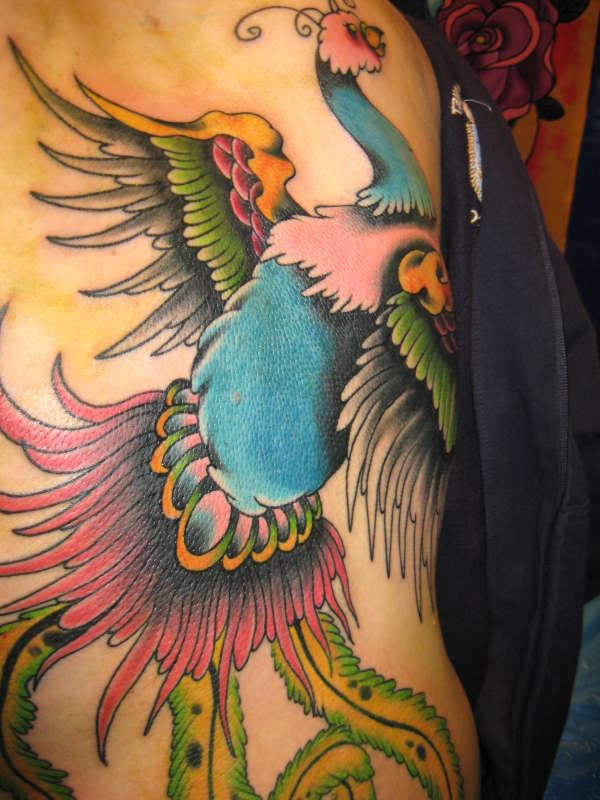 You may want to read on bird tattoo meanings. Towards the end of its life, the phoenix builds a nest with aromatic twigs and sets fire to itself, to be consumed in the funeral pyre, which was its own making. After a period of three days, the bird arises out from its own ashes, reborn. 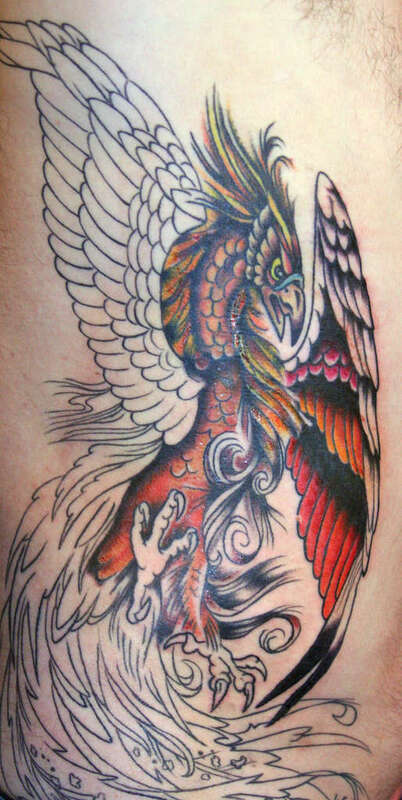 Hence, for a number of people phoenix tattoo designs have become a symbol not only of an undying soul, resurrection and immortal life, but also of triumph and rebirth. 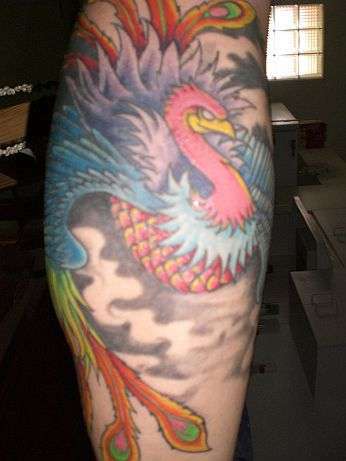 Click to read on phoenix bird. 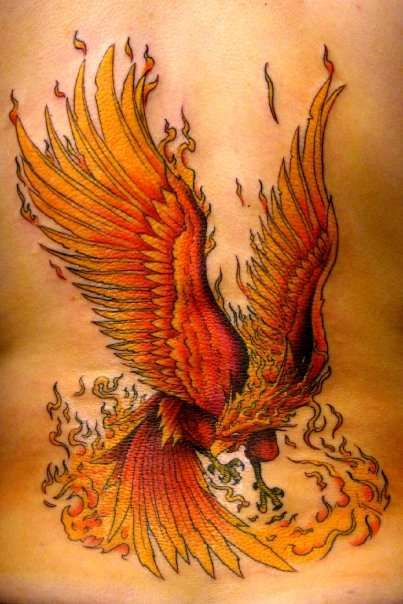 In both Egyptian and Greek mythology, the phoenix is said to represent the sun, dying in flames at the end of the day and rising rising each morning. 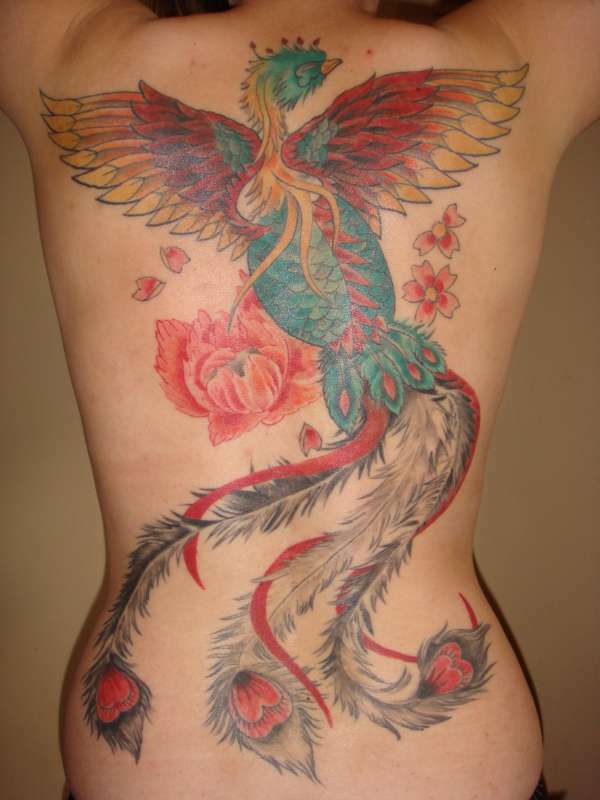 For the Chinese, the phoenix is a symbol of grace and virtue. It is second in importance after the dragon. 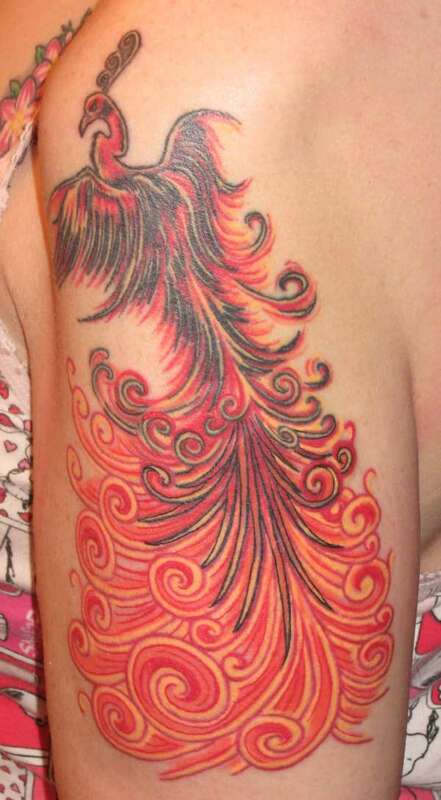 It symbolizes the union of yin and yang and a gentle creature associated with the Empress. 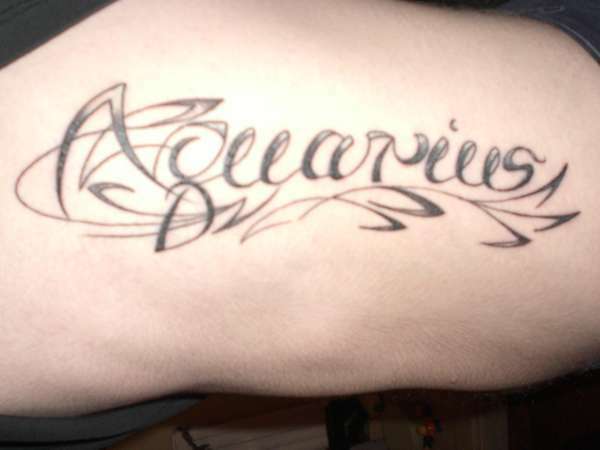 Read on sun tattoo meaning. 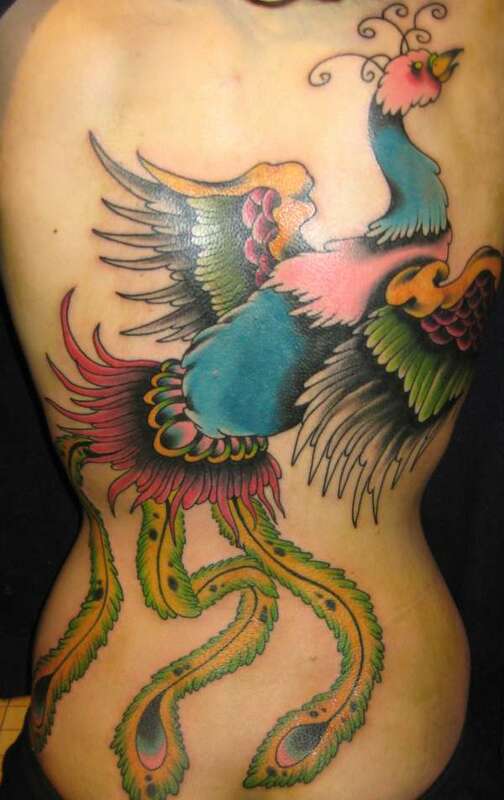 Phoenix tattoo designs for women are very common, as the phoenix is said to have feminine qualities, such as duty, goodness, kindness and reliability. Although these are the lesser known virtues, they cannot be neglected. 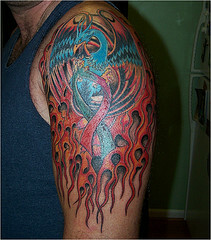 The flame along with the phoenix represents purification and transformation through fire and adversity. 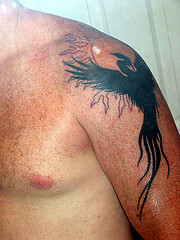 Phoenix tattoo designs for men have become popular as the early designs of a phoenix had the body of a man and the expansive wings of the phoenix. The image has, however, changed over time, but the art remains as it is. 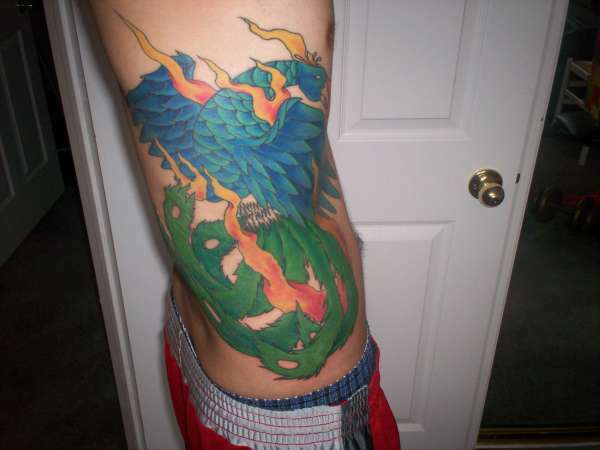 There are some tattoo designs which have the phoenix surrounded by fire. You can also use fire to partially obscure it and show it rising from its ashes or also bursting through the sun. There is an Egyptian legend attached to the bird as well. According to this legend, the phoenix carries the embalmed ashes of its previous birth to Heliopolis, the city of the sun. 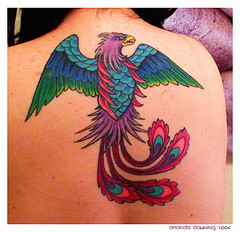 An Egyptian phoenix is said to sing sweetly and it dazzles in the plumage of gold, scarlet and purple. 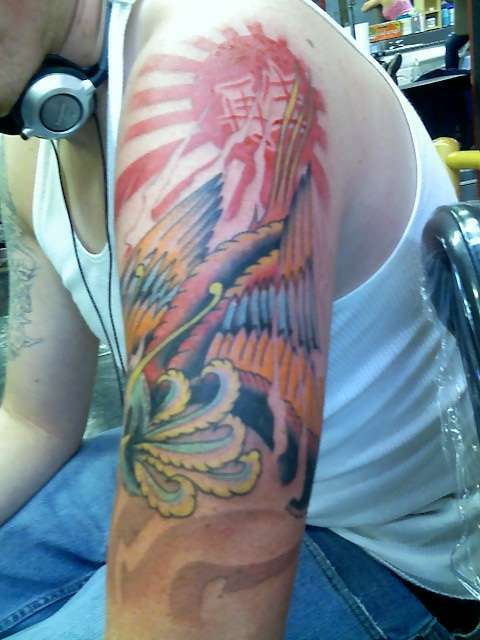 Some of the Egyptian tattoo designs also depict the phoenix with the body of a man. 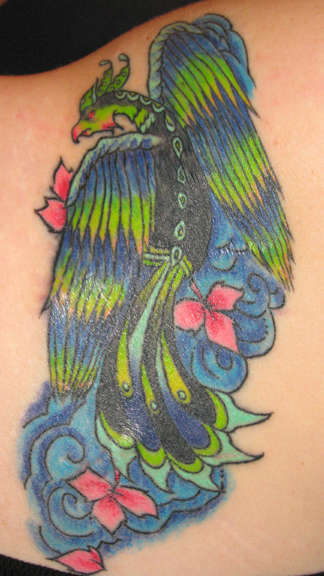 The feathers of the Chinese phoenix are black, white, red, green, and yellow in color. They are the primary colors. In Japan, there is a tradition where the phoenix is carved into the sword hilts and the image of the bird is embroidered on kimonos. 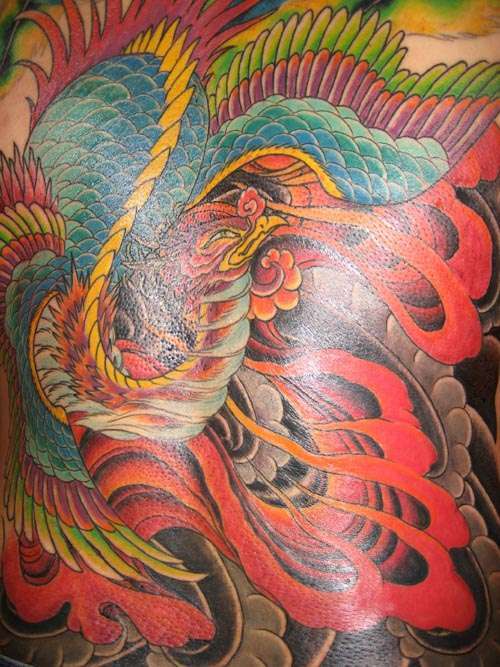 Like in China, in Japan as well phoenix tattoos have significant importance after dragon tattoos. 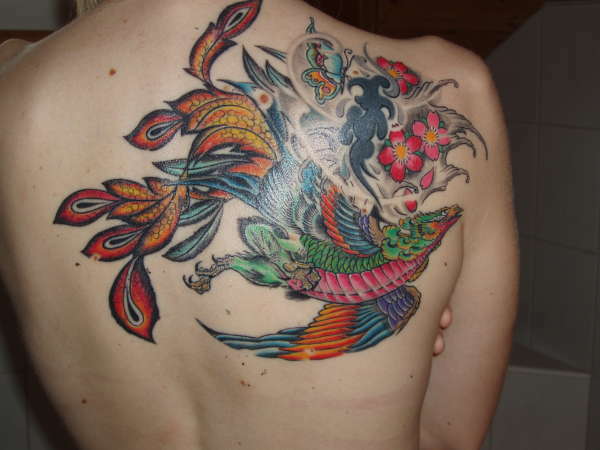 It is often combined with dragon tattoo designs, which is seen as a harmonious combination of the best of feminine and masculine virtues. 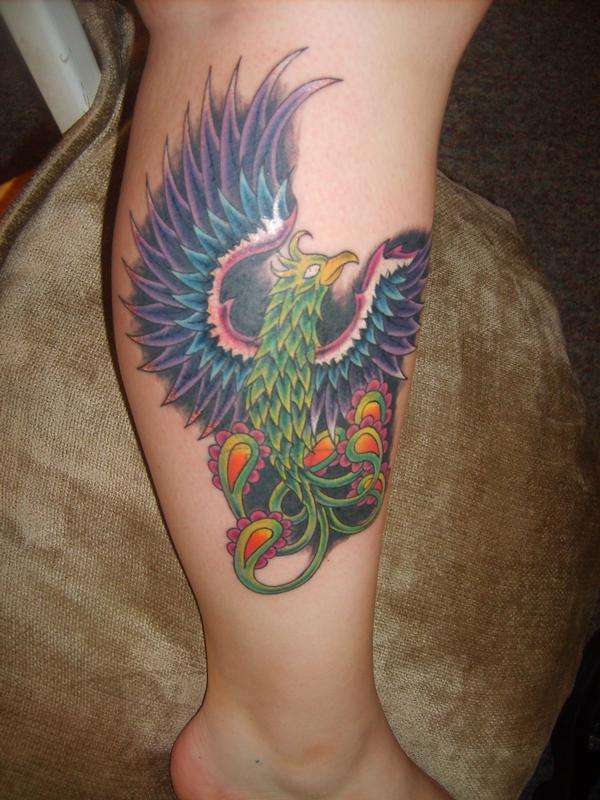 Phoenix tattoo designs are generally huge and encompass large sections of the body, such as the back, chest or wrap around the leg or the upper arm. 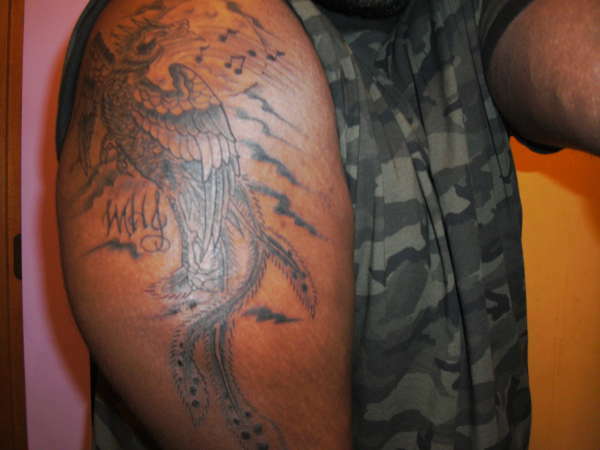 Due to the detailed design, every piece of the tattoo is clear and makes a powerful statement. 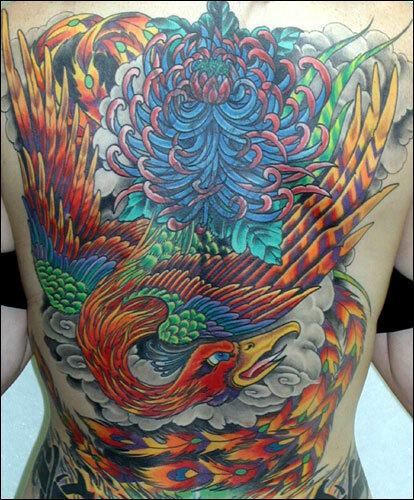 These tattoos are also colorful and often contain red, yellow and orange, as the bird is closely associated with fire and the sun. 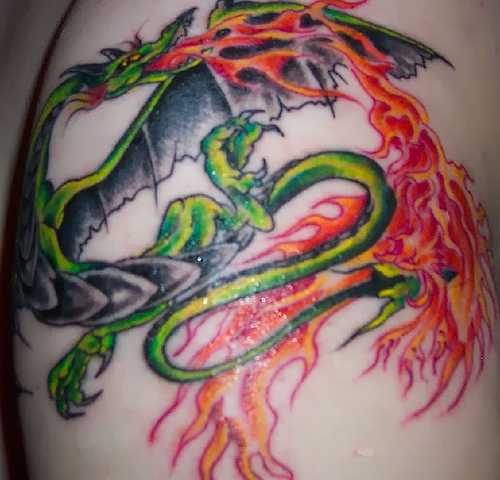 If you want to make the tattoo unique, you can make use of blue, purple, green, copper as well as gold in your tattoo design.